It’s the seventh anniversary of this blog today. I’ve been riding my bike and writing about what I see pretty regularly for a full seven years. That sounds like a long time, sort of, but what seems like really forever ago is me not riding a bike and writing about it. I ride a bike–it’s what I do, for transportation, for fun and pleasure, for vacation and work, for everything. Seven years ago this was not the case at all. Seven years ago I had recently moved to New Orleans with a car, and I was mostly driving to get places. It was my first–and will quite possibly be my last–car. Before then it was all public transportation and asking PK for a ride, but I was on my own in NOLA, and I thought I needed a car to drive away from a storm, because I’d heard they have those down there. Turns out I didn’t need a car, but I did need a bicycle, even though I didn’t know it. S. gave me hers, and I was almost instantly home. Since then, I’ve purchased two brand new bikes. I’ve taken my bike car camping, just the two of us. I got rid of my car. I rode a century, and followed it up with 40 miles the next day. I’ve ridden my bike alongside my sister at her first half marathon, and then rode the route back all by myself. I rode 45 minutes in the Mississippi Delta, and it took twice that time to get back–nothing blocks the winds on that empty land. I rented a bike and rode it on a still-icy path in western Massachusetts. I got two bike tattoos on my right ankle, both bikes pointing forward, because that’s the direction I’m pedaling. I’ve been on bike share bikes in DC and Denver, and ridden from Manhattan to Brooklyn, Arbutus to Baltimore. I have done hundreds and hundreds of the same ride, over an over again–oh, commuting! And this weekend I rode from Niagara Falls to Fort Erie and back with my ladyfriend, who snapped this picture as I pedaled the last few of 40 hot miles. It was a perfect ride on a perfect day, a prelude, again, to new adventures, and I was smiling so big with this perfect life of mine. I love my bicycle and how much bigger my world got when I got back on two wheels, and I can’t believe the same thing is still making me happy and surprising me with new challenges seven years out. And now I’m off to a bus to take me back to my bike so I can ride up the hill to home again home again, jiggity jig. 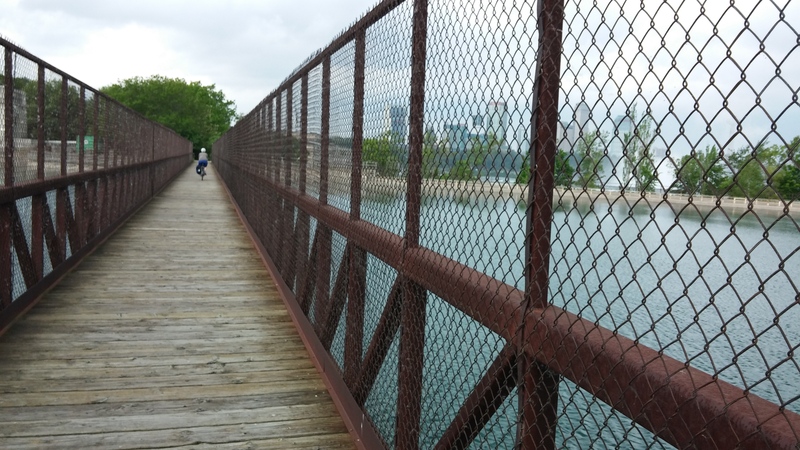 This entry was posted in bikes, personal and tagged bikes, blogging, Canada, Fort Erie, Niagara Falls, Niagara Parkway, personal. Bookmark the permalink. God, but you made me smile from ear to ear. Thanks for bringing us all into this wonderful life of yours.